One of Paterson's most famous industries was the Patent Arms Manufacturing Company, begun by Samuel Colt. In 1836, the Colt Gun Mill, a magnificent four-story brownstone building, was built on an area directly below the waterfalls. Here, Colt first manufactured his newly patented repeating firearm, the revolver, with mother of pearl handles, which were essential in securing the American frontier. Between 1836 and 1841, approximately 5,000 muskets rifles, and revolvers were made here. The revolvers patented by Samuel Colt were manufactured in this building until 1842, when the company failed. Beginning in the 1840's, the site was given over wholly to the manufacture of silk and other textiles; the first manufacture of sewing silk in the United States reputedly took place on this site. As the demand for silk grew, the partners John Ryle and G. W. Murray refitted the fifth floor of the Gun Mill as a weaving shop and constructed three new buildings on the Gun Mill property closer to the river. These buildings – a two-story stone structure, a dye house, and another structure – subsequently became part of the Knipsher & Maass complex. A new boiler was added on the north side of the Gun Mill at the turn of the century. 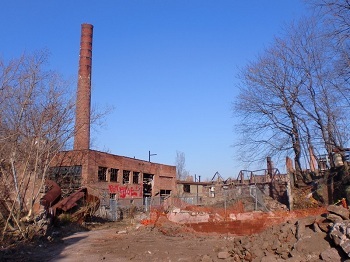 In the 1920's, the upper two floors of the Gun Mill were razed because they were considered unsafe for machinery. 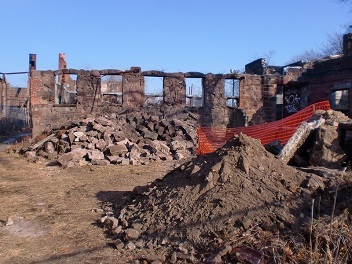 This demolition followed the razing of the fifth floor of the mill and the top floor and colonnaded lookout of the bell tower, which took place sometime prior to 1890. 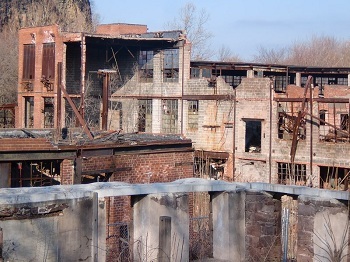 The blacksmith shops located to the west of the old mill were demolished by 1931, and between 1931 and 1937 additional building elements were constructed along the south and west facades of the old mill. In 1983 the mill was closed down and the property purchased by the Paterson Renaissance Partners. A series of arson fires reduced this building and its surrounding ancillary structures to ruins. 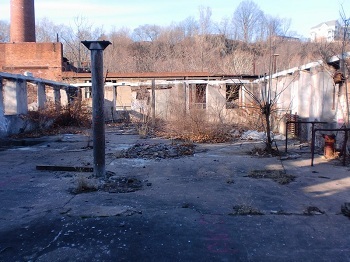 Portions of all of the original walls of the 1836 Gun Mill are intact, including the first two stories of the projecting stair tower. One wall of the copper works, constructed prior to 1899 and located to the southeast of the main building, remains standing.